Teachers in Oaxaca, Mexico, took their fight against their government’s punitive “education reform” to a new level in the past month, with highly visible actions against legislators, political parties, and even airports. On February 5, Constitution Day, teachers surrounded the state legislature and blocked any business from transpiring. The previous day they had blocked the offices of seven political parties. The next day they surrounded gasoline stations. The actions are part of a year-and-a-half-long fight against constitutional amendments that require teachers to take a national competitive exam every four years in order to keep their jobs–among other changes that teachers see as harmful both to their own labor rights and to students. The Oaxaca teachers called a three-day paro, or work stoppage, of their 80,000 members February 9–11 and mobilized members to travel to Mexico City to demonstrate along with teachers from other states. When police prevented them from reaching the capital city’s main square, they took over a major street, causing big traffic tie-ups and causing two subway stations to close. “The education reform hasn’t impacted Oaxaca because of our resistance,” said local leader Lamberto Jiménez. While teacher applicants in the rest of the country all took an entrance exam on the same day last July, Oaxaca teachers blocked the exam site in their capital. Authorities in the states of Guerrero and Michoacán were also forced to call off the test. The National Coordinating Committee of Education Workers (CNTE), the militant movement within the national teachers union (SNTE), says it’s unsuitable to give one national test when conditions differ widely across Mexico. For example, in Oaxaca, one of the poorest and most rural states, students speak indigenous languages from 16 different language families. CNTE is strong in four poor Southern states and in Mexico City. The movement maintains that all graduates of teachers colleges should continue to be admitted to the profession. The CNTE movement faces stiff opposition from its own national union, SNTE, which cooperated with earlier government moves that led to the current constitutional changes. SNTE took out a TV ad that showed CNTE members as vandals and rioters–counterposed to a model SNTE member, well-dressed and in the classroom. Jiménez said CNTE has produced its own plan for bettering Mexican education, which the teachers admit is not meeting students’ needs. The first part is to fix the education infrastructure and provide for the basic necessities of the population. Impoverished children do not come to school able to learn. Second is to develop a realistic means of evaluating students that does not rely on standardized tests. Third is to create a meaningful way of evaluating teachers. The teachers are clear that in any case Peña Nieto’s reforms in no way address the real problems of education: budget cuts, inadequate teacher training, threats to the guarantee of a free education through privatization, standardized tests, students falling behind, and the material condition of the schools. 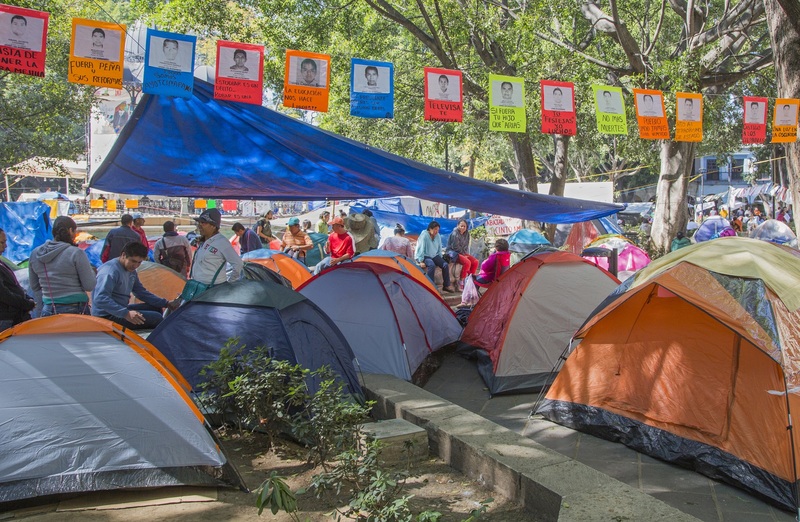 The Oaxaca SNTE Local 22 has been camping out in the main square of the state capital since July, with each region of the state taking turns to send members to sleep in tents. Though the teachers share the space, the zócalo, peacefully with vendors and strollers, they have aroused the ire of those who want teachers to shut up and go home. Some Mexicans are tired of frequent teachers’ strikes, absenteeism, and the fact that some teachers have traditionally inherited their jobs from family members. With their escalation, teachers are responding to a change in the Mexican political climate, caused by the September 26 killing in Ayotzinapa, Guerrero, of six teachers college students, the wounding of 25, and the disappearance of 43. The government claims the murders were ordered by municipal officials and carried out by their allies in a drug gang. For months, the killings have caused widespread protests throughout the country. Posters, banners, and graffiti call for punishment of the guilty. A January 26 demonstration in Mexico City drew tens of thousands, including teachers. Salvador Gaitán, a Local 22 local leader, says the Guerrero murders and similar atrocities elsewhere have changed the mood of the country. Mexicans, he says, are fed up with official impunity. What Do the Pro-Business Reformers Want? The similarity of “education reform” in the U.S. and in Mexico–and of those who promote it–is striking. As in this country, gutting teachers unions and contracting out education services to private groups are major government priorities. Ten days after President Enrique Peña Nieto took office in December 2012, he sent constitutional changes to education to Mexico’s Congress. Ten days later they were ratified–after no discussion with teachers, consultation with education experts, or public debate. The changes were part of a series of pro-business changes Peña Nieto has passed. Another one makes it easier for energy companies to buy small farmers’ land. Another permits PEMEX, the oil company nationalized in 1938, to contract out–which is seen as a step toward privatization. PEMEX reported 10 months ago that it had already auctioned off to investors, including foreign companies, the right to drill in two-thirds of Mexico’s oil reserves. The package of education “reforms” was promoted by a group called Mexicanos Primero (Mexicans First), which the teachers say should be called Empresarios (Business Owners) Primero. Local 22 has written that the changes mean “a true Fordist production line, or the conception of education as a maquiladora factory.” The Mexican Constitution guarantees public education that’s free, non-religious, and compulsory. The teachers see the new constitutional language–which descends to a dizzying level of detail, including a ban on junk food in schools–as a first step away from those rights. As in the U.S., one of the stated goals is more local autonomy for school governance. But teachers say the changes are really a mechanism for privatization–opening the way to contracting out services such as cleaning, accounting, and language teaching to local officials’ brothers-in-law. They point to failed experiences with autonomy in Central America, where schools have had to rely more and more on foundations, businesses, or parents’ own contributions. Another part of the reform is to lengthen the school day: “full-time schools.” Jiménez said that in the state of Quintana Roo, this has led to the closing of night schools, which are often attended by children who work beside their parents selling on the street or in stores during the day. With their escalation, the teachers are responding to a change in the Mexican political climate, caused by the September 26 killing in Ayotzinapa, Guerrero, of six teachers college students, the wounding of 25, and the disappearance of 43. CNTE says the true goal of the reforms is massive firing of teachers, who are a thorn in the side of the administration. The examination process does nothing to evaluate how a teacher performs in the classroom; it is purely a test of knowledge. If teachers fail the test, they may try again, but there is no process for helping them to improve. The approach is purely punitive. 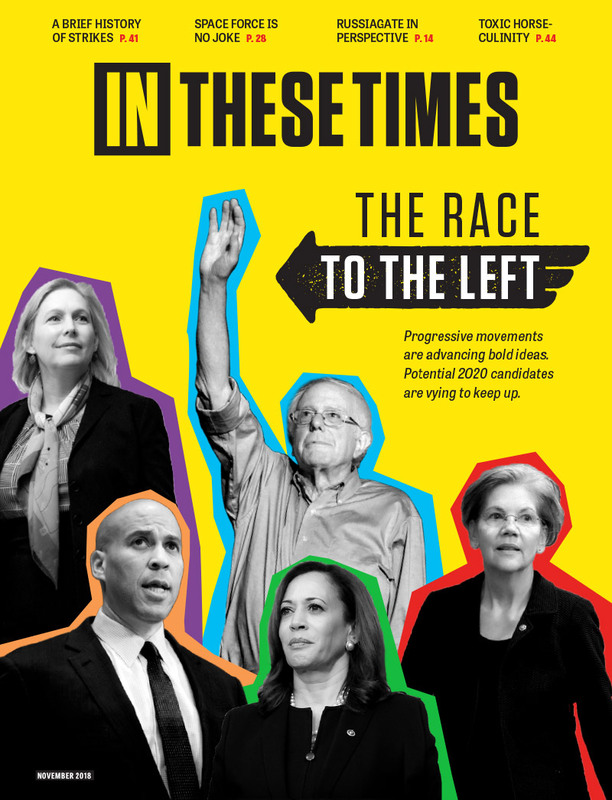 Just as in the U.S., where education evangelists want to replace experienced teachers with brand-new college graduates from Teach for America, in Mexico under the new rules anyone with a degree can take the qualifying exam and become a teacher, with no training whatsoever. Jiménez points out that such employees would be preferable, in the government’s eyes, to graduates of the teachers colleges, where students are from poor and indigenous families. The teachers colleges traditionally have been centers of radicalization–as in Guerrero, where the 43 missing students were about to participate in a protest when they were kidnapped. The Oaxaca teachers and their counterparts in Guerrero, Chiapas, and Michoacán have been demanding the complete abrogation of the constitutional changes–but Oaxaca’s Local 22 seems to have accepted that they may win only in their own state. Jane Slaughter works for Labor Notes in Detroit.